VATICAN CITY—In an effort to make the holiday as stress-free as possible for everyone, Pope Francis asked congregants gathered at St. Peter’s Basilica Thursday if it would be okay to just do a low-key Easter this year. 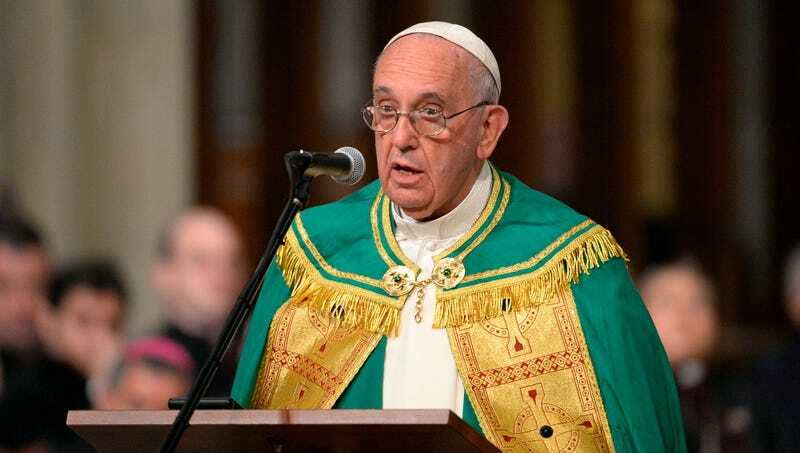 “I know we usually get dressed up and make a big deal out of Easter, but wouldn’t it be nice if just this once we had one laid-back mass on Sunday and then called it a day?” said the Supreme Pontiff, noting that while he loved the tradition, he was completely swamped for most of Lent and did not have much time to prepare for the Christian festival this year. “We can definitely do a little communion Easter morning, and maybe we’ll have a quick homily, but, honestly, can we all just save ourselves the hassle and skip Good Friday?” At press time, the Pope was stressing that Easter was really about spending time with loved ones while wondering aloud if it might be better for everyone to just grab brunch at a bistro in Rome’s Flaminio district.